Growing up, Keith Bonney dreamed of becoming a football player. Turns out, he has scored plenty of “touchdowns” in his career — but they’ve been in the field of education instead of on a football field. “I love kids and love watching them grow into adults. 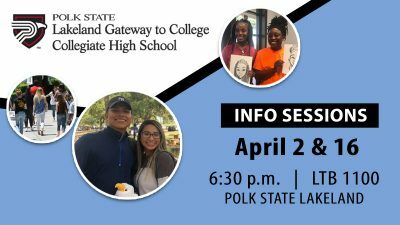 I can’t imagine anything more fulfilling,” said Bonney, who became an assistant principal of Polk State Chain of Lakes Collegiate High School in August. After graduating from Bartow High School in 1979, Bonney chose to blend academics and his love of sports by earning a bachelor’s degree in Health and Physical Education and a master’s degree in Sports Administration from Indiana State University. 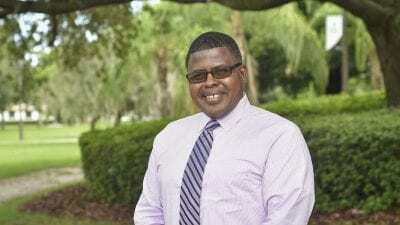 He is currently pursuing a doctorate degree in Organizational Leadership and College Curriculum at Nova Southeastern University. Bonney has been teaching health and wellness classes at Polk State as an adjunct professor since 2003, but to introduce him to those who haven’t had the chance to be in his classroom, News@Polk recently sat down with him to talk sports, career twists and turns, and how, in his case, things have had a way of turning out even better than he could have planned. During middle school, Bonney’s friends encouraged him to try out for quarterback. At that time, no eighth-grader had ever been a first- or second-string quarterback; those spots were reserved for ninth-graders. Then, during a practice, the second-string quarterback broke his ankle during drills. The coach called Bonney over and said, “Bonney, get ready to take snaps,” Bonney recalled. By ninth grade, he was a first-string quarterback. Bonney played football throughout middle school, high school, and college, but as time went on, what was once a game started to feel more like work. “Football beyond high school is a totally different experience. In college, it’s not just for fun. Players have to be able to look at situations and call plays, while in high school everything is set,” he said. His interest in playing football was already waning when he and his Indiana State teammates met the University of Maryland in 1983. “The quarterback was throwing like a laser. The rest of the team and I were in awe of his accuracy,” Bonney said. “Our quarterback came back to the bench and said, ‘Man, we have to finish school.’” Bonney agreed and remembered the advice his mentor, Ken Riley, a former cornerback for the Cincinnati Bengals, once gave him: “Don’t put your eggs in one basket. Be a professional in something.” That advice is what led Bonney to turn down a free agent tryout with the Green Bay Packers. Following that 1983 game, Bonney did some serious soul searching. He’d always been “bent on being a professional player,” but with the realization he couldn’t bank on that, he needed a plan B. “My coach at Indiana State, Dennis Raetz, was big on education. He really drove it home that we were students first and then we played football. My mother was big on education too. She used to say, ‘You don’t have to go to college, but where are you going to stay?’ I started thinking about all these influences, and then all the fun I had working during the summers and my senior year of high school at the Carver Recreation Center in Bartow. I thought, ‘That was so much fun, working with the kids. 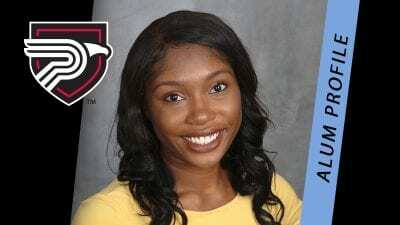 That’s what I can do.’” Before coming to work at Polk State, Bonney worked as an alternative education teacher, physical education teacher, Title I facilitator, dean of students and assistant principal at K-12 schools.